Finally, a quick fixer is available for Windows 8 that lets you fixes a complete 108 system problems, from fixing the Windows errors, to tweaks, to opening task manager or registry history, to enabling or disabling common Windows features, just everything. 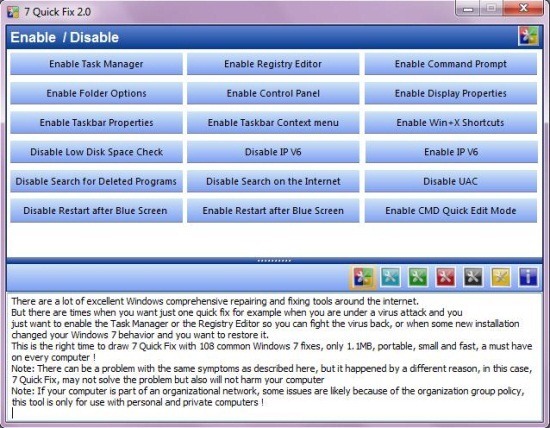 7QuickFix is a free portable Windows 8 software to keep your system fresh and to improve its overall performance. We can not deny the fact that there are many such fixing and repairing tools available for Windows over the Internet. However, at times you just need a single quick fix to fix Windows error in a sec. For instance, when your system is under an unknown Virus attack, you of course, need to enable the Registry Editor or the Task Manager that lets you fight back with the error. This is where 7QuickFix comes into existence as it is fast, quick, small, portable, basically a must have tool in your Windows 8 OS. Installing Quick Fixer in Windows 8 is very simple, however, before I proceed further with its installation steps, let me quickly jot down the main features of this Windows 8 fixer below. Six different categories for fixes such as Errors and Crashes, Performance, Enable or Disable, Missing Stuff Restore, Tweaks and more..